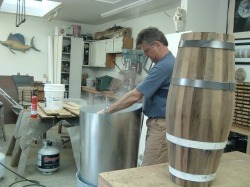 Steaming the drums takes many hours. 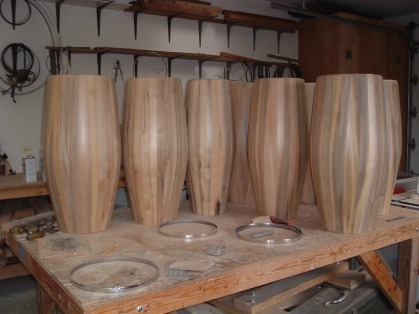 The actual shaping and drying process can take months and overall production time varies according to outside weather. In the photo below, drying drums soak up the rays in the northern California winter sunshine. One style Peter has produced had an intense, high gloss. Getting this high gloss with hard finish takes lots of heat and energy. 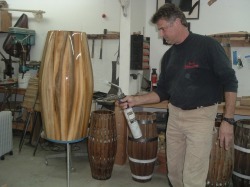 Here Peter is using a torch to remove the bubbles from the epoxy sub-finish. 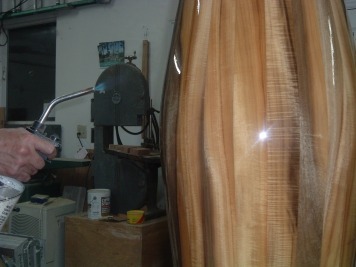 The shine of the hard gloss is sparkling, while the beauty of the pepperwood grain shows through. 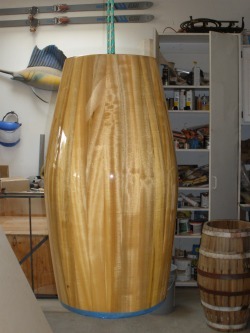 The dried epoxy lends itself to a more durable finish and an incredible shine. 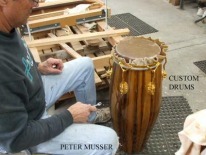 Here's my newest offering: oak congas made from used, aged, and re-purposed California wine barrels, in commemoration of drums made by the original Afro-Caribbean master drum builders. 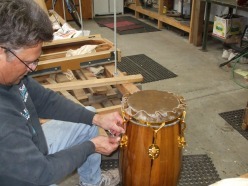 I am a one-man shop, and currently I am concentrating my efforts on this traditional method of drum building because there has been a large demand for this style. One customer wanted hammered, 23K Gold plated hardware mounted on a quinto. The result was stunning. Here is the conga cajon and stand together. Stands can be built for either standing or sitting, according to performer's preference.